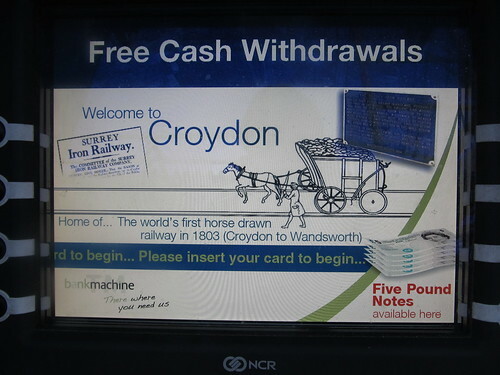 This entry was posted in Railways and tagged Croydon, Surrrey Iron Railway. Bookmark the permalink. Let’s be clear, the SIR was not the first railway (railway, being a road made of Iron, not wood as the Woolaton Wagon way was). Even from its inception it was intended that a branch would continue north to the Grand Union Canal via where the Savoy Hotel is sited today. Its southern extension, The Croydon Merstham And Godstone Railway was given by act of Parliament, the rights to continue to Portsmouth, although it never made it that far. More importantly and in many ways the civil engineering discipline used in construction made it a modern railway. When the Wimbledon and Croydon Railway was built they simply laid over the trackbed of the SIR. Its historical importance is without doubt, and even Stevenson acknowledged this, although he did declined building locomotives for the railway. Today Tramlink is, at least in part, The Surrey Iron Railway.